When it comes to steamboat, I'm all up for it. I really do enjoy steamboat, particularly the broth or soup. I like it sweet, spicy, flavourful and of course, piping hot. I personally believe that the foundation to a good session of steamboat lies in 3 things - broth, freshness of ingredients and company. I mean, that's what steamboat is all about - company with friends or family. The spacious and rather eye-catching entrance. Nestled in the busy streets of Kota Damansara, more specifically, Sunway Giza. Gourmet Definition is what I would call a step above the rest. In other words, a premium level steamboat. What do I mean by premium - do continue. The ambiance is one of the criterias. There are two floors in total but with several dining areas. The images above showcases the first floor, where most of its functions, events and even private parties can be held. There are about 5 large table at the central area, along with 2 private rooms which I will show later. Another thing to add is the fact that it works as a karaoke room as well. Which was really surprising, considering that it's a steamboat place. However, all that requires reservation before hand, which is reasonable. These are the two rooms that I've mentioned - the private dining room that fits up to 12 people and a meeting room for those who fancy a smoke or some quiet time discussion. Technically, it comes in two themes as well - Oriental and Western. Back to where I was seated. Each element in Gourmet Definition Steamboat was thoughtfully created and designed. The plates and bowls are personalized which really brings out the character of the place. Each table is fitted with a marble top and a built-in induction cooker so its hassle free and more hygenic. Some of their homemade sauces. Red chili, green chili and fried garlic with oil. For appetizers, we started off with a titan-sized oyster. Served with a little watercrest, lemon wedges and tabasco sauce. Having one of these certainly will satisfy that craving of yours. It was really fresh and packed with an incomprehensable richness of the sea. Definitely worth ordering. Followed by a generous serving of cutely fried beancurd cubes. Lightly crisp and beautifully soft on the inside. Flavours weren't very overwhelming hence having more of these wouldn't make you feel artificially stuffed. Another cutely cut cubes of brinjals fried till crispy perfection and topped with a generous handful of pork floss. Incredibly addictive for some reason. Coupled with half a dozen of signature chicken wings, deep fried till crispy perfection while maintaining an incredibly moist core - it was absolutely delicious. Howver, I personally felt that it could use a little more oomph in the batter. Apart from the array of starters and steamboat choices, they too have an incredible amount of healthy homemade organic juices. The combination above was certainly refreshing, while the use of dry-ice was ingenius. As I've mentioned previously, the broth or soup for steamboat is extremely important. It's one of the essentials that makes a good steamboat, and a foundation for a great one. 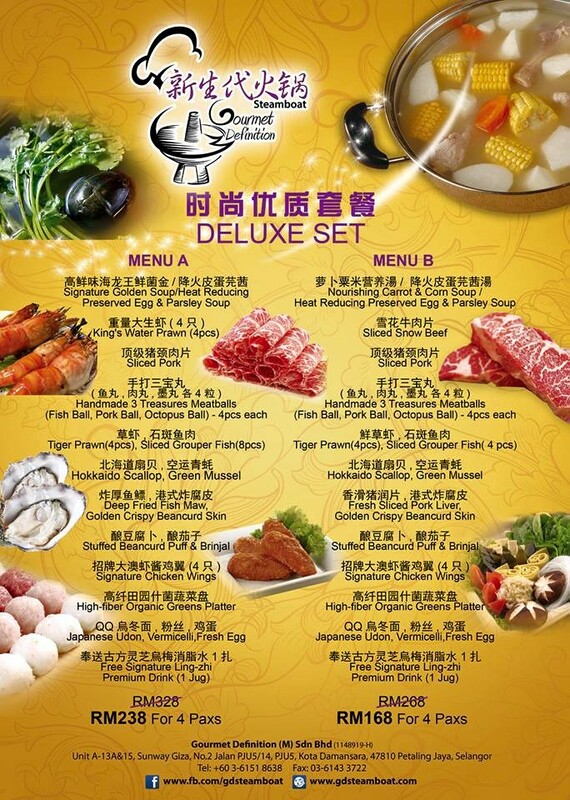 Fortunately, both the broth from Gourmet Definition Steamboat falls within the category. Featuring their signature Fish Head Soup with Chinese Herbs (at least 15 of them) and Chef Signature Secret Golden Soup. The Fish Head Soup had a pleasant and light taste to it essentially, but requires addition ingredients and time to reduce so that it gets sweeter. Which is a good point in any clear-type broth. You'll also find a large fish head along with 20% of its body still intact. For the Chef Signature Secret Golden Soup, it is actually lobster-based. Made with the fresh lobster roe, the soup was incredibly flavourful and carried a rich but pleasant essence of the sea. Among the two, I prefered the Chef Signature Secret more due to its heavy and flavourful characteristics. The second critera to a agood steamboat would definitely have to be the ingredients used. The sliced snow beef offered at Gourmet Definition Steamboat were simply marvelous. I mean, look at that beautiful marbling, running across that slice of beef. Cooked within seconds, the sliced snow beef tasted not only fresh, but full of flavour as well. Look at the beautiful beef! Having pork in steamboat certainly is quite common. However, having a Spanish Loin on the other hand, is incredibly rare. Capable of being eaten medium-rare, the Spanish Pork Loin is one of premiums among the line of pork. A minimum cooking time of 3 seconds is enough to eat these bad boys. I personally prefer 5 seconds as 3 seconds felt a little too raw for me. But overall, really fresh and absolutely addictive. Followed by an array of fresh seafood such as scallops, mussels, prawns and fish, along with some of their homemade meatballs. In terms of freshness, there was no complains. Everything was as fresh as it could get, especially the meatballs. However, the only thing I personally dislike was the size of the bowl. Heck, it takes up quite an area. Among all that, I really enjoyed the homemade meatballs - especially the beef. They're made to be really dense but incredibly soft and juicy as well. The core of eat meatballs had no air pocket, which meant that everything was blended beautifully by the skills of the chef. I didn't know this, the reason each ball was served on a spoon isn't how I intend to use it. Like this, I thought with the uniquely bend spoon, each ball could be placed inside the soup without getting lost. It worked really well but that wasn't the intention. I guess I found out something new then? Haha. In terms of flavour and texture - loved it! Not forgetting vegetables of course. With all that protein, it's crucial to have some fibre in your diet. Fresh greens, several types of mushrooms, tofu and corn - a simple but absolutely delicious pick. Apart form all those, there are also some pre-cooked items such as the stuffed brinjal, stuffed chili and stuffed tofu. They aren't any different that most that I've had except for the freshness. However, it was enjoyable to have too. Noodles, I think is pretty important too in any steamboat as a carb-supplement. The Organic Spinach Noodles are certainly worth the try. In conclusion, I think Gourmet Definition Steamboat has just set a new benchmark for all the steamboat lovers out there. Fulfilling 3 key criterias - broth, freshness and service, it is indeed a great place to dine. The staffs were really attentive - both in terms of recommendation and operations. The change of plate is very common here, so do not be surprised if they come asking for it every 15-20 minutes, or whenever your plate is about 30% messed up. The constant refill of water too was absolutely delightful. For the first time (or perhaps the first few times) that I did not have to request for a refil. They just came over and did their jobs - brilliant! Cleanliness really checks out too, which is great. Who on Earth wants to dine in a place infested with mice or cockroach right? Prices however, are slightly on the higher side compared to most. You're expected to spend around RM20-30 for lunch and about RM30-50 for dinner - which in most cases, isn't so bad. After all, Hometown or several other steamboat places would easily costs RM30-40 per pax. For those interested, there is a ongoing promotion now. RM238/RM168 for 4 pax. Definitely worth the try, especially when they have King's Water Prawn, Hokkaido Scallop, Sliced Grouper and homemade meatballs. Soups are refillable with no charge too!